While working through my photos from this year's trip to Texas, I (Marcel) came across this photo of a grebe. At the time the photograph was taken, there were both Least and Pied-billed Grebes in the pond, and I had assumed this was a Least. A few days ago, I looked at this photograph more closely and realized that something was amiss! I wondered if it could be a Least x Pied-billed Grebe hybrid. However, Pyle says that this type of hybrid has never been recorded before. I sent it to Tony Leukering and he also suspects that this is what a hybrid of that cross would look like. Note the huge bill and yellow eye. 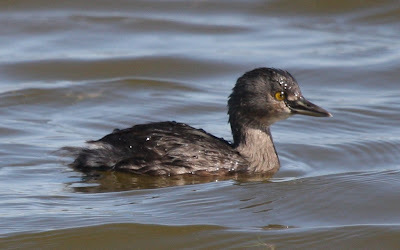 The only other option I can think of is a Least Grebe with a deformed bill. 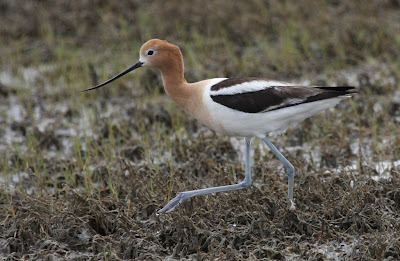 If you have an opinion on the identity of this bird, please leave a comment. We recently attended the 2009 Colorado Field Ornithologists' Convention in the San Luis Valley of Colorado. Check out the ABA's Young Birder blog "The Eyrie" for my write-up, and some more of Joel's (and our mom's) great photos from the convention.